Last night’s opening of How Long? 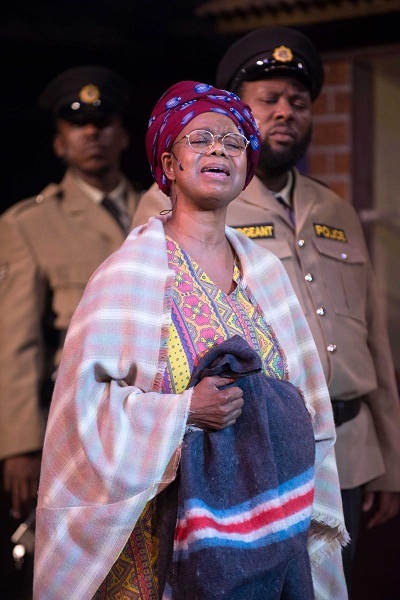 at the Playhouse represented a highly–charged and excellent interpretation of the late Gibson Kente’s musical drama. The foyer was an exciting kaleidoscope of colour with patrons garbed in the dress code of 70’s township flair. It is 45 years since the production was last performed. Until then, it had appeared in township halls and community venues before it was banned. Known as the Father of Black Theatre in South Africa, Kente was one of the first writers to deal with life in the South African black townships. He was arrested and imprisoned for six months after How Long? was filmed during the Soweto uprising. He never got to see it presented in a state theatre or with an orchestra or contemporary dance, as we did last night in the Playhouse Opera. This impressive new production of How Long? is presented by The Playhouse Company to salute Africa Month and is skilfully directed and re-imagined by Duma Ndlovu who has an impressive track record in theatre, film and television. He is also the custodian of the Gibson Kente Foundation. The musical is a commentary on Soweto township life of apartheid times when police brutality and heartlessness were a daily occurrence. It’s also a tale of community life in all its many challenges of the time. The story focuses on a dustman, Twala (Mondi Makhoba), who is battling to find enough money to keep his son Africa (Lungelo Ndlovu) in school, especially since he has successfully passed the JC exam. However, Africa does not have a passbook and this is a cardinal crime in the eyes of the police. Besides Makhoba and Ndlovu’s impressive interpretations of their roles, there are fine performances all round. Particularly good performances come from Phindile Gwala, Ntokozo Mzulwini, Nqobile Ndlovu, Mlamli Ningiza and Bathandwa Gumede. Mduduzi Nombela was a fiery Sergeant and Khaya Dladla created much humour as the cheeky Bhatata. The star of the show is undeniably Thembi Mtshali-Jones who plays Khulu (Twala’s mother). Providing support and advice to one and all in her community, particularly the schoolchildren, she is the one who suffers most in the end. Her solo towards the end of the production was a show-stopper! The Playhouse commissioned the orchestration of Kente’s music which features a six-piece band and a 13-piece ensemble from the KwaZulu-Natal Philharmonic Orchestra conducted by the show’s musical director, Phelelani Mnomiya. The mix of electronic and acoustic music works well, providing a richness to many of the works, particularly some beautiful choral harmonies. Acclaimed choreographer Somizi Mhlongo has equally successfully mixed traditional township dance styles with contemporary dance. The effective set is designed by Greg King. With the KZNPO members in the orchestra pit, he has placed the band high at the back above a row of township houses. Scene changes are effected by movable units working as a living room, bedroom and a funeral parlour. Other images such as the church and courtroom are flown in. Dylan Heaton’s lighting design sensitively handles the various moods. This production is a must for young people who have little knowledge of what things were like in the townships in those dark days of apartheid. However, it is a splendid 31-member production full of high-octane energy and definitely worth seeing. Dialogue is in English, isiZulu and isiXhosa. How Long? runs in the Playhouse Opera until May 27, 2018. Performances are Fridays at 19h00; Saturdays at 14h00 and 19h00; and Sundays at 14h00. Tickets range from R100 to R150. Bookings are through Computicket outlets, by phone on 0861 915 8000, or online at https://online.computicket.com/web/event/how_long/1202363702/0/85836586. Alternatively call Playhouse Box Office on 031-369 9540 or 369 9596 (office hours).